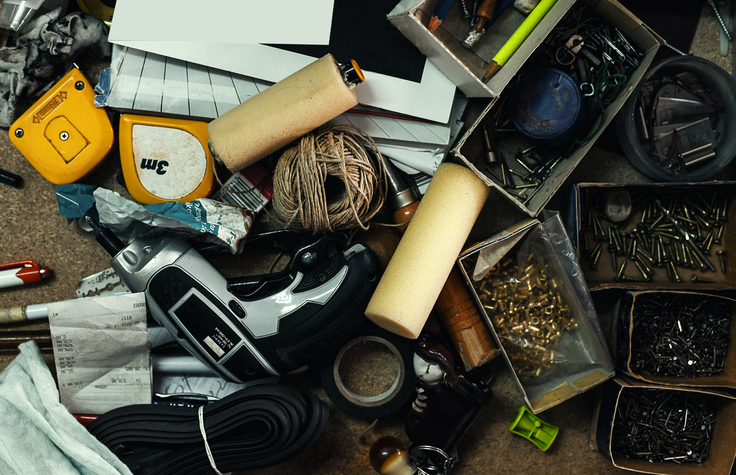 From binder clips to measuring tapes, rubber bands to batteries, junk drawers often hold a lot of miscellaneous stuff. It’s no wonder that over time they can get out of control. Even professional organizers have trouble taming it. Luckily, at Closet & Storage Concepts we’re here to help you make the most of your space. Tame those drawers with our tools and tips below. Going through a lot of stuff can get messy. Lay newspaper, paper bags, or a small tarp (old shower liners work perfectly) on your counters or floors. By doing this, you will help prevent dust and dirt from spreading throughout your home. Plus, having a work area will make it easier to see and sort through all of the things that are being stored in your drawer. Once you’ve gone through everything, it’s time to place things back into the drawer… Or maybe not. Seeing everything laid out is a great visual tool to find items that do not belong. For example, makeup or athletic tape may be suited to your medicine cabinet or bathroom, while a hammer or battery back for the drill could be better stored in the garage. Finding a better home for items is one way to declutter your junk drawers. Labeling makes it easy to find items quickly. Put labels on bags for spare parts, electronic cables, and compartments. Untangling electronic power cords and headphones is frustrating. Even more so if you find that a cord has been damaged because of improper storage. Use cord wraps and other tools to store cords neatly. This will make it easy to grab cords when you need it. It also gives the junk drawer a cleaner appearance. Dividing up a drawer is key to creating separate storage compartments and to keep like items together. To maximize vertical space, use double decker divider trays. Reduce landfill and keep your drawer organized. Egg cartons or ice cube trays are perfect for small items like spools of thread, push pins and needles. If your junk drawer is deep, mason jars or old plastic lunch containers can help you divvy up a drawer. 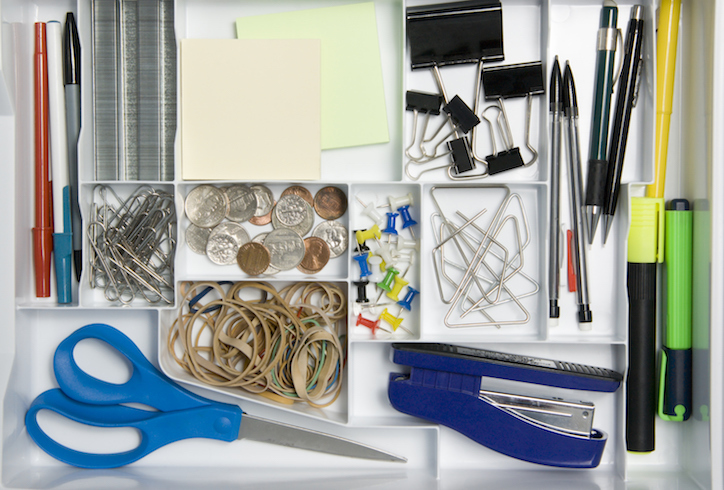 Maintain organization by purging your junk drawer regularly. In most homes, going through once a month can be all that is needed. When purging, make sure that only the necessary items are being stored inside and place items back into their slots if needed. Taming your junk drawers is possible with a little training! To start remodeling your home and make the most of every room from your closets to your office, find your Closet & Storage Concepts location. Photo credits:  © dejankrsmanovic. © eurobanks.